I am using the last phpBB 3.2.5 version with PHP 7.2.14 with MySQL(i) 5.7.21-log. I am using phpBB Native Search and my Database have 1.21Gb. I've a pretty good plan at OVH (or thats what I think) with a private database server with 1Gb RAM. But it seems I am using more then 1Gb RAM and the forum is being too much slow lately. I've talk with some friends and they've some websites (Wordpress) and some of them forums with (SMF and Xenforo), one of the Xenforo is pretty big (Bigger then mine with more users logged in at the same time), and they said to me that even for 1Gb database the ram would never be used to cache the entire database size. And the one with the bigger xenforo forum said to me that his forum doesnt reach 100Mb of usage. max_connections - 100 or 200.
max_user_connections - 50, 100, 150 or 200. A link to your board would help. What extensions do you have installed? Realize, though, that server configuration is generally beyond the scope of this forum. It was working fine with the Search as MySQL, after changing to Native, the database pass from 500 to 1200mb. And after some days we notice the slowness. But I prefer to use native since MySQL is kinda limited on the search. And dont provides all results. the database pass from 500 to 1200mb. For clarification are you referring to the table size or the RAM usage. If I recall correctly the table size of Native vs. MySQL is more than double. Where are you getting this statistic from? Nothing - everything works as intended. phpBB's native search requires keywords which want to be found to be indexed, hence stored somewhere. That's why it needs a rather "big" database table. MySQL Fulltext works by hugely increasing table indices, effectively also growing the database size. But does this more efficiently. Ask your xenForo guy which search system is used there (most likely it also sticks to a DBMS solution instead of providing its own, or it doesn't even have one, which would mean slow searches once the board grows). Also there are different ways to count the size of a database, i.e. most people forgot the size of the indices or the storage overhead. I know thats the database is bigger because of the search engine, thats not a problem. The problem is that the forum itself its using a lot of RAM. Dunno if its related to the search engine. How can this use 1Gb Ram? Something is not right. How can I debug the ram usage? Any idea? Database Size. But the Ram usage had reach 14 times a day the 1Gb RAM usage. And this is a RAM that is used only for this database. Its a private database instance with 1gb ram only for the database. The database size I can get from phpmyadmin or ACP itself. About RAM usage, from OVH Admin Panel. There is an information that goes red when it bypass the limit of 1Gb Ram. He does accepts the database to use more then the 1gb ram but he shows some warnings. How can I debug the ram usage? Any idea? Use in your url like mysite.com/forums/viewtopic.php?XDEBUG_PROFILE& . . .
see if any extensions you have enabled are bringing you down somewhere, use the name of the folder they're held in as keywords. You haven't even stated which DBMS you use. 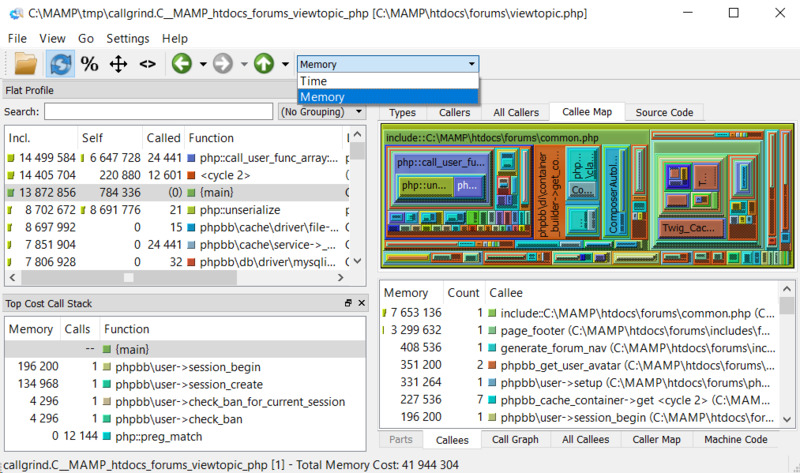 If it has a RAM usage that doesn't fit your needs then ask for help where that software is maintained - phpBB is not a DBMS and has no influence on its RAM usage. @AmigoJack I told on the first post. I'm using MySQL. Thnks Toxyy. But I dont have php.ini access. In any case I'll take a look at it. Im on a shared service, but with a private database. Maybe I can test it locally with xampp to see if I can found out an culprit on any extension. "MySQL(i)" is a driver/interface - it could still mean you use MariaDB or other MySQL compatible ones. https://forums.mysql.com/list.php?24 looks good for asking your RAM questions, or even requesting support. 1 GB of RAM is really not much for an SQL server, especially one where the database is over 1GB. By default, MySQL will try to hold the entire database in RAM for the best performance. It will also frequently be creating join products when a query asks to join two tables, which will consume further RAM. But with the database being larger than 1GB, it cannot keep your database entirely in RAM, so it will have to swap certain tables to disk in order to fulfill requests. Thus your slow down. The chances of such slow downs grow as your traffic grows, because different users will be doing different operations which require different tables to be loaded, and to create more Join products in memory. First tip: The MySQL fulltext index is most likely still present. You should have an option to delete that in the phpBB admin panel (Maintenance -> Search Index). I don't have a fulltext mysql install handy to look at, but that's my recollection. Secondly: You may be able to optimize MySQL configuration for a constrained memory environment, but this is unlikely to provide a great deal of relief.